Remove the tuna from its marinade and pat it dry. Drizzle over a little toasted sesame oil, and cover each side in a generous cracking of black pepper. 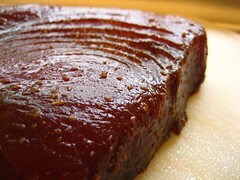 Heat a cast-iron skillet (I prefer cast-iron because it gets really hot) until it’s smoking, and slap on the tuna. It will sizzle and smoke like crazy. Cooking times will vary depending on preference of doneness. I let the white creep up the side just a smidge before I turn it over (about 2 minutes per side). I remove it from the iron and let it rest for a bit. To serve, I slice it against the grain and arrange it on the plate. 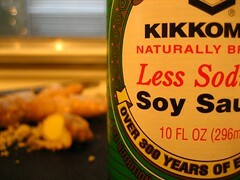 I spoon over a simple mixture of soy sauce, grated ginger and a drip of honey. Garnish with chopped chives. We just got back from Whole Foods where we bought the ingredients for today’s (July 4th) post. We’re grilling, of course, but not your typical hamburgers and hot dogs. 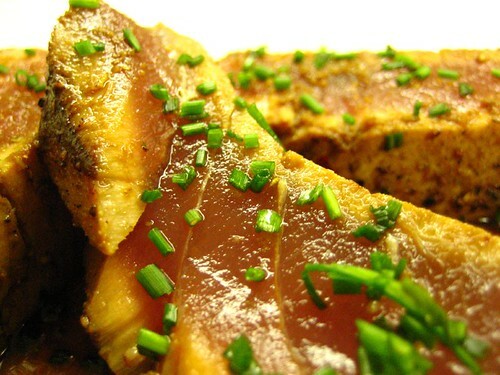 I’m doing my Seared Ginger Tuna with soy and chives. This is the first post in a two part series. We bought about a 1 lb. fresh yellow fin tuna steak. I placed the steak in a zip top bag and drown it in low sodium soy sauce (I prefer low sodium sauce because it enables me to control the flavors, and because regular soy sauce comes on a little too strong for me). 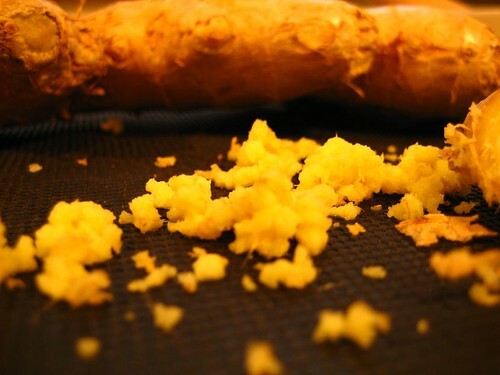 Next, I grate in some fresh ginger root and I let that imbue the tuna for a couple hours.